With well over one hundred and fifty years cumulative experience in the boat repair industry, our crew is well prepared to assist you with your boat. Sadler’s slow and steady growth over the years reflects our commitment to hiring only quality employees with the right attitude. All of our staff understands our commitment to safety, quality and customer service. We encourage you to use this page as a starting point, then swing by and build a relationship with us. We think you’ll be glad you did. As part owner (along with the rest of the Busey family) and manager of Sadler Point, Brooks has spent over fifteen years fine tuning the operation. You'll see him in the office as well as out in the yard, hauling and launching boats. David came to Sadler with an impressive amount of marine parts sourcing and service writing experience. As a graduate of MMI he also has a solid technical background. His people skills and eagerness for communication add immeasurably to our service department and help make the difference when it comes to organizing your project. Kenny has run our fiberglass and woodshop since 2008. He's been in the boat business since the 1960's, working with local legend Bill Wellington for three decades building sailboats to 63 feet. If you need something fabricated in wood or fiberglass, Kenny's your man. With 50+ years in the boat maintenance and repair business, Chip is a veritable wealth of knowledge. He brings his experience and technical problem solving skills to bear on our most challenging repair and fabrication projects. You'll also see him operating our lift equipment. Brian relocated to Jacksonville in late 2016. He is a Factory Trained Yamaha Master Tech who adds depth of knowledge to our existing team. 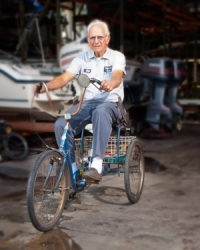 He enjoys spending time working on his personal boat and is currently overhauling a vintage CJ Jeep. 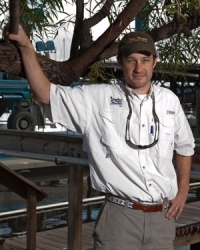 Erik is a top notch technician who specializes in mechanical, electrical and general marine systems. He started with us in 2007. His easy going manner and calm troubleshooting style make him popular with our customers. 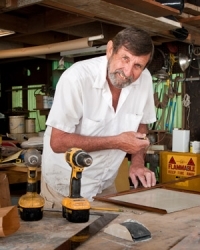 Nephew to Kenny, Jerry comes from the same long line of local boat building and repair experts. Jerry has a reputation as one of the very best gelcoat repair techs in North Florida and is also a talented mechanic and rigger. Our latest "Eric" came to us in 2017. He's a Marine Corps Veteran where he spent years as a Helicopter Mechanic specifically servicing the CH-53E Super Sea Stallion. He has a degree from Tulsa Welding School and has been quick to learn the ins and outs of running our TraveLift, Hydraulic Trailer and other yard equipment. The younger version of one of our lead techs, "Little Erik" as he's affectionately known around here, has been helping us out with the increased business we've seen while still working on a college degree. You'll see him helping out with all aspects of the service department. Patrick came to us after helping a friend build a 33' plywood sailboat from scratch. His Eagle Scout credentials and enthusiasm for hard work have made him a valuable part of our team. 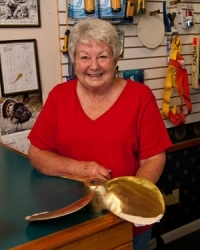 Cindy has had an administrative role in area boatyards since 1984. She's been keeping us in line since 2004. 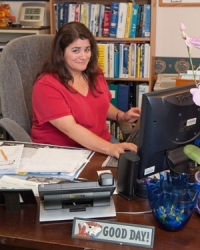 As our office manager, her responsibilities include scheduling, invoicing and keeping track of our ever increasing parts inventory. She's most likely to answer the phone if you call during the week. Miss Betty is our chief landscaper and weekend office manager since 2005. If you notice something on our campus that's freshly planted or painted, she's probably the one who made it happen. 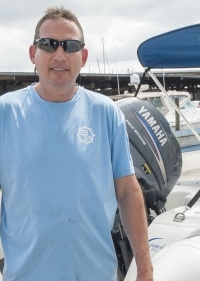 Tom, an experienced marine professional and licensed yacht broker, recently joined Sadler to assist with our new retail sales of Kencraft boats, as well as adding used boat brokerage to Sadler’s operations.